Developer Steve Pittman outlined plans for a 44-home neighborhood planned on 36 acres just south of University High School at the Aug. 21 Carmel Plan Commission meeting. 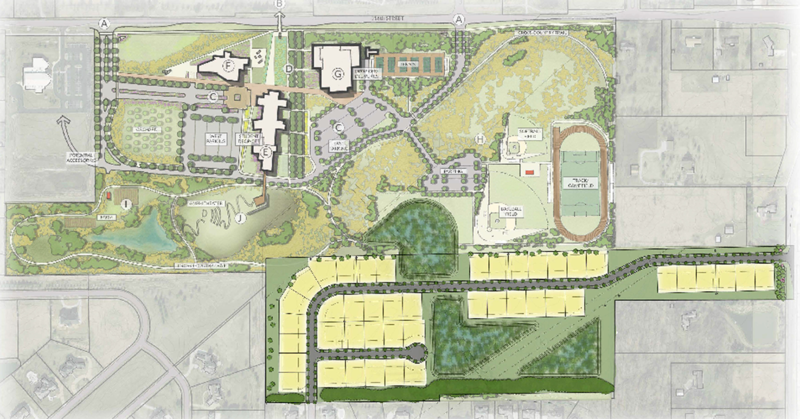 Several people who live near the proposed The Parks at Towne Meadow expressed concerns while others gave their support for the project before commissioners voted to send the matter to the Sept. 4 CPC residential committee meeting. The full plan commission will have the final vote. Lot sizes are anticipated to range from 14,000 to 15,000 square feet with homes expected to cost between $700,000 and $1 million. A builder has not been selected. Pittman purchased the land from UHS earlier this year after school leaders completed a master plan and realized they had an excess of 36 acres. He said he is working with the school to come up with a drainage plan, a trail system to connect the neighborhood to West Park through the UHS campus and an educational easement that will allow students to do water-quality testing or other classwork on a portion of the property. “It really is going to be a nice partnership between our two entities,” Pittman said. Most of the residents who spoke at the meeting were from the neighboring Kings Mill and Huntington Chase neighborhoods, and many praised Pittman for meeting with them and addressing concerns. Among those concerns are maintaining trees to provide a buffer and the density of lots, specifically in the panhandle on the east side of the site, bordering multi-acre estate lots. Many remonstrators said they were against building a road to connect to UHS property. Commissioners asked Pittman to specify several items before the committee meeting, such as where a trail might tie into a future UHS trail system. Commissioner Joshua Kirsh asked Pittman to consider changing the development’s name.